I love pasta in the evening. Especially because cooking the pasta normally takes longer than preparing the sauce. It's always a quick and therefore easy meal. 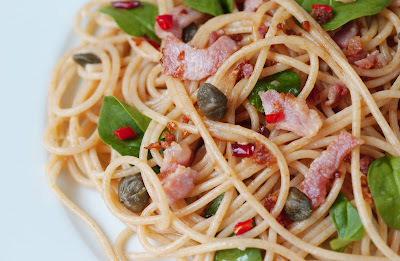 This recipe is based on the classic spaghetti aglio e olio recipe, extended by bacon, fresh red chilis, capers and some raw green leaves. The capers and the green leaves give it an extra note and crunch. For a vegetarian version: The recipe definitely works without the bacon too. Cook the spaghetti in boiling salted water, according to instructions. Heat the olive oil in a pan over medium heat. Add garlic and chilis and saute for about 1-2 minutes over medium to low heat. Keep an eye on the garlic as it burns very quickly. If you want a non-vegetarian meal, add the cut up bacon at this stage and fry it for 4-5 minutes. Then add the capers and keep them in the pan for another 2-3 minute. If you are using baby spinach leaves, cut them into strips. If you use arugula, wash it. The leaves can be used as wholes in the dish. Drain the spaghetti when it's al dente. Pour the chili and olive oil sauce over the drained pasta and mix well. Stir in the the arugula/baby spinach leaves. Serve immediately and sprinkle crumbled feta cheese on top.